First-time home buyers and investors are jumping to take advantage of state and federal tax incentives, low interest rates, and prices that are more affordable than they have been in many years. California's median home price climbed in April on a monthly basis for the second straight month. That hasn't happened since August 2007, the California Association of Realtors reported on May 28. Home sales in April rose 49% compared with April 2008. The most promising sign of stabilization is the strikingly low inventory of unsold homes—well below the historical average. It would now take 4.6 months to deplete the state's supply of unsold houses at the current sales pace. Supply was as high as 16.6 months in January 2008, and the long-term average for the state is about seven months. California has some advantages over other states that were also ravaged by the housing slump. Construction in the state's coastal areas was fairly limited during the boom and—unlike Florida and Nevada—builders focused on single-family homes rather than condos, resulting in fewer new housing units. And California, despite its economic problems, has a diverse job market, natural beauty, top schools, cultural depth, and great weather. ...it was Schumpeter who worried more than any other modern economist about what might be called the fragile condition of capitalism. He did so having lived through the economic horrors of Weimar, witnessed the terror of Soviet-style political economy, experienced the Depression -- and seen the chaos of World War II. Plenty of destruction, to be sure. His life's work concentrated on entrepreneurs renewing the economy through what he called "creative destruction." If Schumpeter were alive today, he would surely ask, What caused this crisis? And, is this kind of scandal or drama endemic to the nature of capitalism itself? While a lot of attention has been given to the first question, I want to focus on the more ominous second one. Namely, how to save capitalism from a potentially fatal reaction to this crisis. As a general rule, only capitalism can create wealth and liberty at the same time. And, of course, capitalism can expand welfare faster than any other social or economic order has ever done. Since the New Deal, Americans have come to see government as somehow the ultimate protector of their financial welfare. In reality, though, the evidence of the U.S. government behaving in this way during the New Deal is thin to say the least. Although it is largely forgotten now, much of the government's action during the Depression actually had a marginal impact on individual lives. Monetary expansion and technological innovation boosted the economy, while the "second" depression of 1937-1938 is widely understood as having been induced by Roosevelt's attempt to manipulate credit markets. So what about the ultimate Schumpeterian challenge: Can capitalism be saved? France's President Nicolas Sarkozy in October 2008 proposed a brilliant formulation. He said: "The financial crisis is not the crisis of capitalism. It is the crisis of a system that has distanced itself from the most fundamental values of capitalism, which betrayed the spirit of capitalism." No doubt, in the face of the continuing financial crisis, entrepreneurial capitalism is threatened. All over the world, people are giving greater emphasis to personal security. Their taste for assuming personal risk may be chastened, at least for the moment. This is an altogether rational and expected response. Where that becomes troublesome, however, is the moment when government comes to be seen as the sole source of security. What we, the public, need to understand is that the best guarantor of security is not government. It's economic growth. While we want to believe otherwise, the cold fact is that government can't guarantee economic permanency. Nobody, and nothing, can. Whatever road we choose, entrepreneurial capitalism cannot be revived or flourish if new government security programs end up attenuating the individual's ultimate responsibility to attend to his or her own welfare. Several weeks ago, I participated in one of the regular roundtable discussions hosted by the folks at the California Real Estate Journal. The topic for this discussion -- which was published on May 26th in a separate section -- was on real estate finance, chiefly for commercial real estate projects. Functioning mostly as an economic advisor, my name was suggested by Beacon Economics' Chris Thornberg as a way to provide an alternative voice to the roundtable. Other participants included Paul Brindley (Holiday Fenoglio Fowler), Lewis G. Feldman (Goodwin Procter), Joseph Foreman (Bond Street Capital Cos.), Holli Leon (PNC ARCS), Heidi McKibben (Fannie Mae) and D. Eric Remensperger (Proskauer Rose). If you want to read the entire transcript for the discussion, click here. It was an interesting discussion, and I'm sure would make an interesting read. Interview with author Anthony Downs, "Real Estate and the Financial Crisis"
Yesterday I interviewed Dr. Anthony Downs, author of the new book out by the Urban Land Institute called "Real Estate and the Financial Crisis: How Turmoil in the Capital Markets is Restructuring Real Estate Finance." Downs, who received his PhD in Economics from Stanford University, is a senior fellow at the Brookings Institution as well as a well-known writer and speaker, and has consulted with the nation's largest corporations, developers and government agencies. This latest title marks Tony's 27th book, which I'll soon be reviewing for the Inman News service, but for now you can listen to the podcast on the widget below (due to a minor technical glitch, my bumper music started playing during the intro, which threw me a bit. But that's show biz!). Downs has also written "Niagara of Capital: How Global Capital Has Transformed Housing and Real Estate Markets," "Still Stuck in Traffic," and "Growth Management and Affordable Housing: Do They Conflict?" Earlier in his career, he also wrote "An Economic Theory of Democracy" and "Inside Bureaucracy." If you want to buy this book from Amazon.com click on the link below. Back in March, I blogged about the importance of neighborhood distinctions in L.A., citing a recent attempt by a relatively small portion of Van Nuys to be absorbed into neighboring Sherman Oaks. The reason this battle ignited my interest was that I have several friends who live in the affected area, plus I own some property there and had learned first-hand the differences between the two. Given the constant ebb and flow of neighborhood boundaries being re-drawn and renamed (such as a portion of West Van Nuys to Lake Balboa, North Van Nuys to North Hills to Encino or a part of North Hollywood to Valley Village), I figured the change would pretty much meet little or no opposition by local neighborhood councils as well as by the L.A. City Council. I thought the reasoning laid out by the proponents on the group's Web site, PartofShermanOaks.org, was rational and was merely meant to correct a previous error of nomenclature by the city. Boy, was I wrong! Van Nuys Neighborhood Council President, Lydia Mather and Sherman Oaks Neighborhood Council President, Jill Barad site NEW reasons why it will be detrimental to Van Nuys if our community were to be allowed to be renamed Sherman Oaks. The opponents to our name change application met with Councilmember Wendy Greuel according to her staff. In this meeting Lydia Mather stated that our community constituted 20% of all single family homes in all of Van Nuys. This figure is important because it is an established fact that home ownership contributes greatly to the stability of any neighborhood. However, as we learned more about the evidence presented to the Councilmember - we began to wonder if all is what it seemed. Regardless of our findings - we all concluded that our community may have a high level of home ownership compared to other parts of Van Nuys, but the people living in this community have a right to self- determination - AND WE ARE MORE THAN A STATISTIC. I once served on the board for a similar neighborhood council in San Diego called 'Uptown Planners,' and I can tell you first-hand that decisions made by these groups are not always rational. On our board, we had a split between those who knew change was inevitable (including several architects) and those who said "No" to any change or new development because it made them uncomfortable (as well as a semi-coherent magpie who just liked to complain). After one particularly contentious meeting, a reporter called me for comment because I was "one of the few rational voices on the board." But the City of San Diego took our meetings quite seriously, even sending out a representative from our City Councilman's office each time we met. I shudder to think how many bad decisions are made because a few people get drunk on power. From my experience, I can only guess that Jill Barad, a 33-year resident of Sherman Oaks, simply doesn't like the idea of 'her' neighborhood boundary expanded -- even if it negates the rights of residents for self-determination. How I wish that all of my own personal opinions, with little respect to fairness or relevance, could also be made into law! That power Ms. Barad wields must be heady indeed. As for Ms. Mather, I can sympathize with her more, because having a portion of her designated neighborhood join a better-managed one to the south on her watch has got to be embarrassing -- and an inconvenient failure should she some day want to seek higher office in local politics. But neither should her personal ambition thwart the rights of individuals to self-determination. The Sherman Oaks Chamber of Commerce believes that citizens of Los Angeles should, within the framework of City governance, be allowed the right of self-determination to choose inclusion in the neighborhood that is most consistent and appropriate with the community in which they live and identify. Such a choice should not be at the expense of other citizens but, rather, in a manner that is reasonable and intelligent. This identification should make sense in terms of City services and administrative representation. The residents and business people in the area north of Burbank Boulevard and south of Califa Street and east of Sepulveda Boulevard and west of Hazeltine Avenue are currently caught in a political and educational no man’s land. These citizens are within the 2nd Council District and are lucky, in my opinion, to have been represented by you as their Councilmember. So there currently exists a Los Angeles City perspective that includes these families and businesses in the community of Sherman Oaks. The children of this area all go to elementary and middle schools located south of their residences within Sherman Oaks. So the Los Angeles Unified School District and the State of California have determined that this area in question is part of the educational community of Sherman Oaks. The Sherman Oaks Chamber of Commerce does not think so. Changing the name of this area will not hurt anyone that lives or works north of this area. Changing the name of this area will not alter the governance or the school association of this area or that of anyone else. Complaints about this area name change are based of issues of self-image and associations for which the good people of this hamlet had no responsibility. They just want to be included in their own community. Wendy, I grew up in this very area and I know this area very well. The residents of this area have always felt affinity for Sherman Oaks. School and shopping locations, as well as political representation, have made it so. And my own father often stated, when asked, that he lived in Sherman Oaks. I fully understand that the Van Nuys Neighborhood Council and the Sherman Oaks Neighborhood Council have voted against this request for area name change. But I do not think that the stakeholders in this area are getting a fair hearing in those venues. I was the lead negotiator representing the Sherman Oaks Neighborhood Council in the initial border dispute with the Van Nuys Neighborhood Council at the time of NC formation. We never even discussed this area, nor did we do any due diligence and ask these residents for their input. I now realize that we erred in not doing so. I ask, in the name of the Sherman Oaks Chamber of Commerce, and in respect for the wishes of the residents and businesses of the area in question, to right that initial wrong. Please allow the children of this area to be included in the same community as the other children at their schools. And allow the citizens of this area to be included in the same area as other citizens in your council district. Such an action by you would cost the city little. But it would unite this area with the community that they have lived in and identified with for the last sixty years. This Thursday, May 21st at 12 noon, I'll be interviewing Anthony Downs, author of the book "Real Estate and the Financial Crisis: How Turmoil in the Capital Markets is Restructuring Real Estate Finance," which I'll soon be reviewing for Inman News. This is the 27th book for Downs, a PhD-educated economist with the Brookings Institution, who has also written "Niagara of Capital: How Global Capital Has Transformed Housing and Real Estate Markets," "Still Stuck in Traffic," and "Growth Management and Affordable Housing: Do They Conflict?" Earlier in his career, he also wrote "An Economic Theory of Democracy" and "Inside Bureaucracy." Downs, also a well-known speaker, has consulted with the nation's largest corporations, developers and government agencies, so I'm looking forward to an interesting interview. Want to listen to the interview on Thursday? Click here, although if you miss it I will post it as a podcast and link to this blog. Want to buy his book? Click here to order from the Housing Chronicles bookstore at Amazon.com as well as his previous books and those of other authors I've interviewed. Phoenix's housing bust has turned into a quasi-boom, a sign that its market may have hit bottom and a sneak preview of what a national housing recovery could look like. Phoenix experienced one of the most dramatic real estate crashes in the nation. Median home prices for resold homes peaked at $268,000 in June 2006. Now the median price is $120,000. It is the biggest decline in the top 20 metropolitan areas tracked by the Standard & Poor's/Case-Shiller home price index. The collapse was devastating in a city that has long depended on housing to power its economy. In the last year, Phoenix lost 41,000 construction jobs and 136,000 overall, accounting for 7% of its workforce. Home building came to a halt. Many illegal immigrants, discouraged by the sudden lack of jobs, returned to Mexico. Realtors cut staff. Home prices dropped faster and faster each month for two years. Skeptics of the turnaround note that the competition for foreclosed homes may be artificial. They argue that the number of bank-owned properties has shrunk because some lenders held off on foreclosures early in the year as they waited for President Obama to unveil his plan to aid distressed homeowners. As a California native, I've felt almost all of the large earthquakes in the state in my lifetime (including 1994 - Northridge and 1989 - Loma Prieta), and yet am still surprised to learn than only 1 of every 8 homeowners carries earthquake insurance. Although such insurance for multi-family buildings can be very pricey -- and is therefore rejected by many HOA boards -- for single-family homes it can be much cheaper, depending of course on building type, age and location. The Orange County Register's Jon Lansner has a podcast interviewing Pete Moraga from the Insurance Information Network of California, which you can listen to by clicking here. For more information on earthquake insurance, visit the California Earthquake Authority. For more information on preparing for the next big quake, visit The Great Shakeout -- the next statewide drill is set for October 15, 2009. My 70-year-old mother, a dedicated American Red Cross volunteer, has certainly helped bring me up to speed on this issue! Fannie Mae and Freddie Mac, charged with helping lead the nation out of its housing crisis, are facing "critical" financial problems, federal regulators said Monday. The companies suffer from severe financial, operational and compliance weaknesses, the Federal Housing Finance Agency said a report to Congress detailing its annual examinations of the firms. Taken over by the government in September, Fannie and Freddie are not able to operate without federal assistance. To continue functioning, the firms have drawn down about $60 billion of their combined $400 billion lifeline from the federal government. Fannie reported a $23.2 billion quarterly loss and Freddie a $9.9 billion quarterly loss earlier this month. One hurdle to putting Fannie and Freddie back on firm financial footing is the many vacancies in their executive ranks. Hiring has been slowed by compensation concerns, the agency said. While the housing meltdown prompted the companies' near collapse in 2008, this year will also be difficult. Fannie Mae will face challenges as it works with servicers to help troubled borrowers and to manage and sell a growing inventory of foreclosed properties, the agency said. Freddie Mac, meanwhile, needs to improve its internal controls and find a chief executive officer. MIA: fair and comprehensive coverage on the housing market? I was very saddened recently to hear about the death of a reporter I had befriended at the Los Angeles Times by the name of Annette Haddad (I had written about this before on April 22nd the same day I had heard from a former Times staffer) . Annette had taken over the housing beat shortly before I became one of her sources, and over the course of several years we built a friendship based on mutual expertise: she taught me how to effectively work with reporters and improve my chances for getting some ink, and I schooled her on the economic, political and social workings of the building industry. But it was what we had in common which was what drew us together: a genuine interest in the housing industry and a desire to ensure that the story which got published -- even after several editing iterations -- was both accurate and fair. Annette didn’t just write about housing – she lived and breathed it, visiting model complexes and open houses on weekends in order to interview potential home buyers, even sometimes calling me and others on a Sunday afternoon for input. Today’s reporters, often working under considerable time constraints, simply don’t have the time to provide the sort of detail that’s required for a balanced story on the steadily unfolding story of housing sales, prices, foreclosures and financing. Moreover, either out of habit or necessity, many reporters continue to call on the same sources ad infinitum looking for a controversial quote with little regard to whether it’s either responsible or even correct. Other media outlets, working with a skeleton crew, figure it’s better to re-print a wire story from AP or Reuters or publish the latest press release verbatim from a well-known data provider rather than nothing at all. By the end of the month, readers are left with an unconnected mish-mash of often-conflicting housing stories with little or no analysis to tie it all together. No wonder so many are confused! Of course many readers, increasingly viewing traditional journalism as an unnecessary luxury -- and forgetting that it’s crucial to a properly functioning democracy – refuse to pay for online content, believing that any blogger with an opinion and the ability to type will somehow provide an adequate substitute (full disclosure: I am also a blogger). Add to this toxic mix an industry which often shoots itself in the foot by ignoring requests to defend itself, and it’s little wonder that when the average person opines on the housing market, it’s typically a regurgitation of something heard on talk radio or cable television – hardly bastions of objective discourse. Since this is not something which will get any better in a world of bloggers with an axe to grind, how can the housing industry address this issue? Firstly, when a reporter calls for a quote for a story about your company, don’t just ignore it. To most readers, when they read, “Company x did not return calls for comment,” that just makes the firm look flaky, and even a canned response is better than nothing. Secondly, develop long-term relationships with reporters or influential bloggers with the intent of pitching them story ideas. Thirdly, be bold about arguing your case against pundits who only care about seeing their own controversial – and often irresponsible – opinions in print. If the reporter refuses to write a balanced story, take your case up with their editor, and, if need be, write a letter to the editor and get your story told on the many housing-related blogs that abound on the Internet. Fourthly, make sure there’s a responsive person on your staff who will be the responsible point person for all media requests, and be able to introduce in-house experts to address the particular topic. Forcing a reporter to call multiple offices and corporate communications departments not only wastes valuable time, but reveals something potentially unpleasant about a company’s culture: unresponsive, incompetent or uncaring. And that’s hardly the sort of brand image any of us want to convey to a nervous populace already shell-shocked by an economic meltdown. One statistic that stands out in America's recession-stung economy is the unemployment rate for adult men: in April for the second month in a row it surged ahead of the national average to 9.4 percent versus 8.9 percent for all workers. The jobless rate for adult women was 7.1 percent. The reasons are clear: male-heavy sectors such as construction and manufacturing have been hard hit. But the implications may be dire for the broader economy and hamper the recovery as families that once had male breadwinners struggle. "In the 2001 recession, 51 percent of all job losses were for men. It was evenly split. But in this recession 80 percent of the jobs that have been lost have been men's," said Andrew Sum, a labor economics professor at Northeastern University who has studied this issue in detail. The fact that American males without a college degree are especially vulnerable in this cycle point to more hard times ahead for the U.S. working class, which has endured stagnant and declining wages for the last three decades. The skilled and semi-skilled jobs they traditionally held have been moving overseas to places like China and Vietnam. The jobs that remain pay less, amid declining union membership. One study by Julia Isaacs of the Brookings Institution think-tank found median U.S. family income rose to $53,280 by the middle of this decade in 2004 dollars from $37,384 in 1964. But for males aged 30 to 39, average annual personal income fell from the mid-1970s by around $5,000 to $35,000. though construction jobs are seen coming back eventually, spurred in part by President Barack Obama's $787 billion fiscal stimulus plan that includes funds for road and bridge construction. But many manufacturing jobs are gone for good, as huge sectors like the auto industry suffer profound cuts. Doeringer said the recession will leave the economy "sharply restructured". "The construction jobs will return, but we are seeing an unusually sharp drop in what is left of manufacturing and much of that drop will not be recovered when the recession ends, and much of what does remain will have be at lower wages with reduced fringe benefits," he said. Inland Empire Economic Forecast Conference - May 19, 2009! A quick reminder for the Beacon Economics 2009 Inland Empire Economic Forecast Conference next Tuesday, May 19th, at the University of Redlands campus. Want to sign up? Click here. Email us at info@metrointel.com for the special discount code you can use to save money on admission! MetroIntelligence Real Estate Advisors has written the real estate sections (residential and commercial) which appear in the 100+ page book that's given out to all conference attendees. third annual Inland Empire Economic Forecast Event. Rocked by foreclosures, where is the Inland Empire housing market headed in 2009? All conference attendees receive Beacon's new Inland Empire Economic Forecast Book - an unprecedented overview of the region's current economic conditions and analysis of what the near future holds. My May column for Builder & Developer magazine is now online; this month's issue focuses on green building techniques, so I discuss what's happening with efforts by the NAHB and LEED for Homes, although I recently received a clarification from Callie Schmidt, the Director of Environmental Communications for the NAHB. For the record, Ms. Schmidt was not one of the persons I contacted prior to writing this recent column, but I will certainly do so when writing future ones on green building. When green building terms and techniques first entered the construction industry’s policies and procedures manuals, they were initially designed for new commercial office buildings, allowing developers and cities to advertise their forward-thinking designs with iconic structures in well-trafficked locations. Today, however, with increasing consumer sensitivity towards sustainability and a higher awareness among home builders that energy-efficient homes can boost both absorption rates and profits, building green homes will likely become the most important trend this industry has seen in a generation. The market could be huge: according to a McGraw-Hill Construction Residential Building SmartMarket Report from 2006, green homes could make up as much as 10% of new construction by 2010 – a quintupling from a comparatively measly 2% in 2005. Seeking to retain its leadership in a quickly changing world, the National Association of Home Builders (NAHB) recently announced that more than 2,700 builders, remodelers have achieved the Certified Green Building (GCB) designation, which requires 24 hours of classroom instruction, two years of industry experience and a commitment to continuing education. First of all, the NAHB University of Housing educational designation that's growing so quickly is the Certified Green Professional (CGP) designation, not the Certified Green Builder. At the time you wrote the column the numbers stood at 2,700; just so you know, it's now at 3,000. Secondly, it's inaccurate to compare the CGP designation to the LEED rating system. LEED certifies projects; CGP certifies people. A more apt comparison might be the National Green Home Certification offered through the NAHB Research Center as part of NAHBGreen. This certification applies not only to new single-family homes, but also to multifamily projects, subdivisions and residential remodeling and renovation. The rating system now gaining popularity at NAHBGreen is the National Green Building Standard, which is the only residential green rating system to be approved by the American National Standards Institute, a distinction that, as you know, lends must more authenticity in the home building community. The McGraw-Hill survey you site was actually updated last year to predict green building starts of between 12 percent and 20 percent by 2012. However, all these surveys are sort of moot now until the market comes back - predictions are pretty much out the window right now. However, NAHB does agree that all our association's initiatives, especially NAHBGreen, the NAHB National Green Building Program, and its educational and certification components, can help its members "lead the way to a sustainable planet." Want to know more about the NAHB National Green Building Program? Click here. Foreclosures in April exceeded even March's blistering pace with a record 342,000 homes receiving notices of default, auction notices or undergoing bank repossessions, according to a regular industry report. Ten states accounted for 75% of all foreclosure activity, and they fell generally into two categories: one-time bubble markets and the Rust Belt. California easily outpaced every other state with with 96,560 filings. Other hard-hit former boom states were Florida, Nevada and Arizona. Those Rust Belts states with the most filings were Illinois, Ohio and Michigan. Five other California metro areas ranked in the top 10: Modesto was fourth, Riverside-San Bernardino fifth, Bakersfield sixth, Vallejo seventh and Stockton eighth. Miami and Orlando rounded out the list. One of the little-known facts about manufactured homes (i.e., those built in factories and then assembled on site as opposed to being built from scratch on the lot), is that they're often better built than 'stick-built' homes. Since builders can provide a much more consistent level of quality control in a factory, that certainly makes sense, but of course there's always been the 'trailer park' factor and sketchy financing that's prevented manufactured homes from selling more than 300,000 or 400,000 homes per year. From its bamboo floors to its rooftop deck, Clayton Homes' new industrial-chic "i-house" is about as far removed from a mobile home as an iPod from a record player. Clayton's "i-house" was conceived as a moderately priced "plug and play" dwelling for environmentally conscious homebuyers. It went on sale nationwide Saturday with its presentation at the annual shareholders' meeting of investor Warren Buffett's Berkshire-Hathaway Inc. in Omaha, Neb. Clayton Homes plans to price the "i-house" at $100 to $130 a square foot, depending on amenities and add-ons, such as additional bedrooms. A stick-built house with similar features could range from $200 to $300 a square foot to start, said Chris Nicely, Clayton marketing vice president. "It does not look like your typical manufactured home," said Thayer Long with the Manufactured Housing Institute, a Washington-based group representing 370 manufactured and modular home-building companies. Where will California's Central Valley be in 2019? There are too many 3,000-square-foot homes for the low median incomes in the Valley," said Chelsey Norton, a planning consultant with Sacramento-based Mintier Harnish. She said it's not just that most people can't afford them. Many won't want them. In 2015, just 10 percent of Valley households will be the traditional nuclear family with a mom, dad and kids, she said. The Valley, said Norton, "is increasingly graying." It's filling with a multitude of varying lifestyles, "with people who don't need isolated large suburban houses." Norton said today's "millennial" generation, born between 1981 and 2001, may have grown up in suburbs. But it wants to live near work and not necessarily in the single-family homes that the boom brought to the Valley. Don't worry, there will be another housing boom. A competing panel at the Great Valley Center conference predicted 13.6 million people living between Bakersfield and Redding in 2050. That's about the time this month's high school graduates will retire. Today, there's just shy of 7 million people in that area – about one-third of them in the Sacramento region. The good news for the capital: It has been gaining brains and income with its growth, according to Joseph Hayes, research associate at the San Francisco-based Public Policy Institute. Not so for the rest of the Central Valley, he said. Is it finally time to buy homebuilder stocks? The basic math of the real estate market is now working in favor of an industry that, believe it or not, has done a remarkable job paring costs and harboring its financial strength for the recovery that's now dawning. Since the number of new homes and apartments now isn't nearly big enough to accommodate the immigrants and young workers crowding the labor force, residents are buying and renting the existing units (albeit at a slow pace). That's driven the excess inventory down to less than 900,000 units. At the present slow pace of homebuilding, the glut will disappear by the end of 2009. Labels: D.R. Horton, Fortune magazine, home builder stocks, Meritage Homes, Toll Bros.
California Builder magazine, the CBIA-associated title which helped to launch my sideline writing career when I was with Hanley Wood Market Intelligence, has announced that the current edition will be the last offline version. 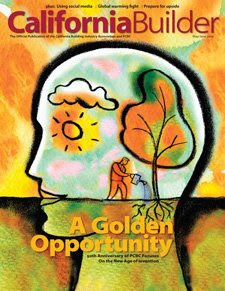 Due to a lackluster ad sales environment and budget cuts, the magazine will now be only online. Between January of 2006 and the middle of 2007, I wrote 9 or 10 feature-length articles for the magazine including market trends for SoCal/CentralCal/NorCal, high-rise condos, mixed-use developments, master-planned communities, transit-oriented developments and adjusting to the new market realities. I learned a lot from that experience, and it gave me the confidence (and the proof) to pursue more writing assignments with the Los Angeles Times and, more recently, Inman News. The downturn in both the homebuilding and publishing industries has caught up with us, and with ad revenue down sharply, it’s not possible for CBIA to subsidize the magazine’s production costs. So I thought I’d steal the headline from our late Chairman Ray Becker’s last column in 2008, because this issue marks the end of one era and the beginning of a new one. During the first couple of years, cover stories ranged from economic forecasts to exclusive reports on landmark legislation such as SB 800, with promotions for PCBC and lavish coverage of the Gold Nugget Awards regularly occurring as well. We added some new standing features, including chief lobbyist Tim Coyle’s hard-hitting “Checks and Balances” column, which has anchored the back page since July/August 2002. How hard-hitting was it? Shortly after Tim started writing it, he asked us to stop sending the magazine outside the CBIA family so he could continue calling it the way he saw it. We took a big step at the beginning of 2004 when we unveiled a new design that Sandy and I had worked on for several months to make CB more professional. Among the new features were the hard-news “Developments” section in the front of the book and an expanded and rebranded “In the Know” section at the end of each issue to keep members apprised of happenings in the industry. We also introduced design consistency throughout the publication. While the design has been tweaked and improved on bit by bit since then, that look is still the framework for what you see in this issue. A second major development in 2004 was that we hired a full-time editor. The magazine was averaging more than 48 pages per issue by the end of 2003, and it was hard finding time to give the magazine the attention it needed while carrying out my PR responsibilities. We hired Janelle Leader Lamb, a solid publications editor who helped us take CB to a higher level. Under her leadership we were finalists for the first time in the prestigious Western Publication Association’s Maggie Awards competition for magazines west of the Mississippi. And we expanded our coverage to such subjects as builders participating in Extreme Makeover: Home Edition, ways builders could fight back against trial lawyers and new trends in urban infill. It’s been a lot of fun being involved with the growth and successes of California Builder, and there’s a long list of folks to thank — too many to list here. For a full list, check the CB Web site, but I do want to recognize editors Janelle Leader Lamb, Sarah Langford, Dani Kando-Kaiser and Greg Robertson, and art directors Sandy Simpson and Deb Rasmussen for their talent and hard work over the years. Special thanks go to Bob Rivinius, whose column ran in every issue and who was a strong supporter of the publication every step of the way, and to CBIA’s governmental and political affairs staff — especially Tim Coyle and Bob Raymer, whose work ran in both the first and last issues of CB and many in between. Whatever the future holds, it’s been a privilege to help bring this member benefit to you over the years, and we look forward to offering you news you can use online. But it’s still hard for this former newspaper reporter to say adios if not necessarily goodbye to what we always tried to make the best association magazine in the land. The financial results so far are not as dire as those created by the subprime frenzy of 2004-2007, but taxpayer losses are mounting on its $562 billion portfolio. According to Mortgage Bankers Association data, more than one in eight FHA loans is now delinquent -- nearly triple the rate on conventional, nonsubprime loan portfolios. Another 7.5% of recent FHA loans are in "serious delinquency," which means at least three months overdue. The bill that passed last summer more than doubled the maximum loan amount that FHA can insure -- to $719,000 from $362,500 in high-priced markets. Congress evidently believes that a moderate-income buyer can afford a $700,000 house. This increase in the loan amount was supposed to boost the housing market as subprime crashed and demand for homes plummeted. But FHA's expansion has hardly arrested the housing market decline. The higher FHA loan ceiling was also supposed to be temporary, but this year Congress made it permanent. In a rational world, Congress and the White House would tighten FHA underwriting standards, in particular by eliminating the 100% guarantee. That guarantee means banks and mortgage lenders have no skin in the game; lenders collect the 2% to 3% origination fees on as many FHA loans as they can push out the door regardless of whether the borrower has a likelihood of repaying the mortgage. The Washington Post reported in March a near-tripling in the past year in the number of loans in which a borrower failed to make more than a single payment. One Florida bank, Great Country Mortgage of Coral Gables, had a 64% default rate on its FHA properties. A major lesson of Fan and Fred and the subprime fiasco is that no one benefits when we push families into homes they can't afford. Yet that's what Congress is doing once again as it relentlessly expands FHA lending with minimal oversight or taxpayer safeguards. Home values in the United States extended their fall in the first quarter, with more than one in five homeowners now owing more on their mortgages than their homes are worth, real estate website Zillow.com said on Wednesday. But in an early sign of improvement, 17 metropolitan areas across the country -- notably several hard-hit markets in California, including Los Angeles, San Diego and Modesto -- have seen two or more consecutive quarters of smaller year-over-year declines in home values, the reports showed. "Slowing declines in select markets are a bright spot or, at least, what passes for one given current market conditions," Dr. Stan Humphries, Zillow vice president of data and analytics, said in a statement. "Unfortunately, given the magnitude of the current rates of decline, we're still many months away from a bottom even as depreciation slows," he said. "Moreover, the additional information we have this quarter on 'shadow inventory,' with one-third of homeowners indicating they would like to put their home on the market if conditions improve, confirms our earlier fears that a bottom in home values could be quite protracted." Post-recession America may be saddled with high unemployment even after good times finally return. Hundreds of thousands of jobs have vanished forever in industries such as auto manufacturing and financial services. Millions of people who were fired or laid off will find it harder to get hired again and for years may have to accept lower earnings than they enjoyed before the slump. This restructuring -- in what former Federal Reserve Chairman Paul Volcker calls “the Great Recession” -- is causing some economists to reconsider what might be the “natural” rate of unemployment: a level that neither accelerates nor decelerates inflation. This state of equilibrium is often described as “full” employment. That has implications for policy makers as well as workers. The Obama administration and the Federal Reserve are counting on the jobless rate to fall to a medium-term equilibrium of about 5 percent as the economy recovers. A natural rate significantly above that would drive up the annual budget deficit -- which will top $1 trillion for the first time this year -- by reducing tax revenue and pushing up spending on unemployment benefits. Already, almost a quarter of the unemployed have been out of work for 27 weeks or longer, the highest proportion since 1983. Permanent layoffs -- for workers who don’t expect to ever regain the same job -- hit a record 51.5 percent in March. Mass layoffs, those that affect 50 or more people, rose to a record 2,933, comprising almost 300,000 lost positions. Officials of Guaranty Bank of Austin, Texas, which took over the development last year, were unavailable for comment. But Victorville city spokeswoman Yvonne Hester said the bank decided not to throw good money after bad. "It just didn't pencil out for them," she said. "They'd have to spend a lot of money to turn around and sell the houses. They just made a financial decision to just demolish them." The development was in a part of town remote even for Victorville, a wind-swept high desert city of about 100,000 residents. A dozen of the homes were in various stages of construction. Some had frames erected, and a few others had drywall hung, said Jorge Duran, Victorville's code enforcement manager. Ron Willemsen, president of Intravaia Rock and Sand, the Montclair company handling the demolition, said he was glad to see people finding uses for the materials. But wrecking a pristine house troubled him. "It's a waste of a lot of resources and perfectly good construction," he said. Willemsen, whose family has run the business for 50 years, said it was the first time the firm had demolished a new housing project to return a potential neighborhood to soil. 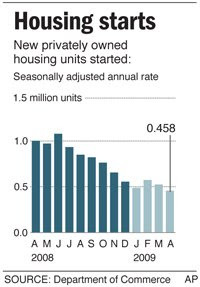 For better or for worse, the depth and length of this housing bust is sure to change the way in which many builders do business. Although this blog has been regularly tracking these changes, Builder magazine's John Caulfield has written an article that summarizes just what types of changes we may see in the future. For more detailed information on the six recommendations visit here. Many builders would argue that recessions come and go, and this one, too, will pass, so why make dramatic changes? But many of these same builders have called this recession the absolute nastiest they’ve experienced, and no one wants to go through this again. So, to help readers who want to avoid such scenarios in the future, BUILDER has assembled six “lessons learned” from the housing bust, based on our reporting since last fall, when the economy took a severe turn for the worse. Samuel Bellamy: Patrick Duffy presents The future of new housing is green posted at Housing Chronicles, saying, "With increasing consumer sensitivity towards sustainability and a higher awareness among home builders that energy-efficient homes can boost both absorption rates and profits, building green homes will likely become the most important trend this industry has seen in a generation." Though his known career as a pirate captain lasted little more than a year, Bellamy and his crew captured more than 50 ships before his death at age 28. Called "Black Sam" in Cape Cod folklore because he eschewed the fashionable powdered wig in favor of tying back his long black hair with a simple band, Bellamy became known for his mercy and generosity toward those he captured on his raids. This reputation gained him the second nickname of the "Prince of Pirates," and his crew called themselves "Robin Hood's Men." Thanks to HotPads Daily for hosting the blog and recognizing The Housing Chronicles Blog!